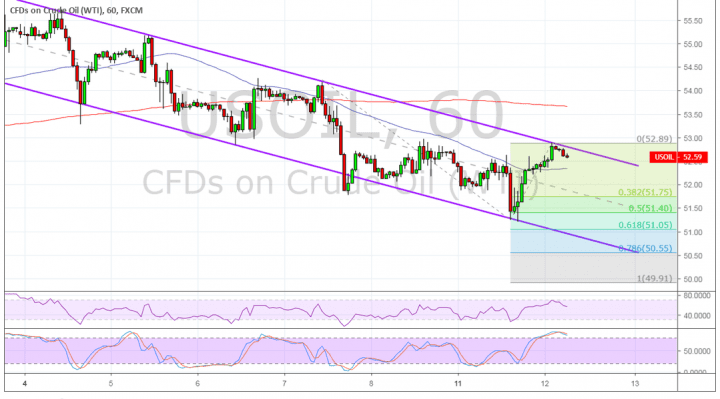 WTI crude oil is trending lower with lower highs and lower lows inside a descending channel, currently testing the resistance. If this holds, price could resume the slide to the channel bottom or the support areas marked by the Fibonacci extension tool. The 50% level lines up with the swing low, which might serve as the first take-profit point. Stronger selling pressure could take it down to the 61.8% level that coincides with the bottom of the channel around $51 per barrel. The 78.6% extension is near the $50.50 minor psychological level while the full extension is at the $50 per barrel mark. The 100 SMA is below the longer-term 200 SMA to confirm that the path of least resistance is to the downside. In other words, the downtrend is more likely to resume than to reverse. The gap between the moving averages is widening to reflect that selling pressure is building up. RSI is turning lower to signal that selling pressure is returning. This oscillator has plenty of room to indicate that bears could stay in control for much longer. Stochastic has just reached the overbought zone to indicate that buyers are exhausted, likely allowing sellers to take over soon. The combination of OPEC output cuts and US sanctions on Venezuela are weighing on global supply, thereby driving prices higher. However, traders still seem wary of demand as potentially escalating trade tensions could hurt business consumption. Traders are also on the lookout for inventory data to see if US production is strong enough to revive oversupply fears or if it’s just in line with demand. A larger than expected build could revive global supply glut concerns, especially in the backdrop of trade tensions between the US and China. A draw, on the other hand, could spur a break past resistance levels if this assures traders that demand is keeping up.